Chateau / Country House5651 sq. 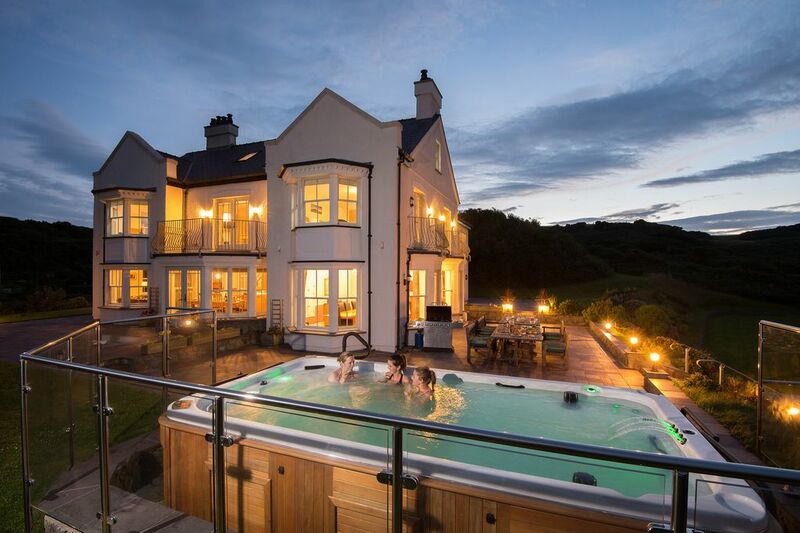 ft.
Llanlliana House is a beautifully renovated, luxury Country House set in 168 acres of private estate in a designated 'Area of Outstanding Natural Beauty' which includes a private beach, coastal cliff top walks, St Patricks Island and the most northern point of Wales. Enjoy the fabulous coastal walks over the Iron Age Hillfort with Choughs & Peregrines nesting on the cliffs. Llanlliana House is very secluded and just a five minute walk to the cove and Anglesey Coastal Path. Quiet and peaceful, perfect for walkers, photographers & wildlife enthusiasts yet only ten minutes drive from the pretty seaside village of Cemaes Bay with shops, pubs and the local fishing boats with fabulous shellfish to collect for supper. For a fully relaxing holiday book the in house cook for delicious meals of local produce. Llanlliana boasts 10 bedrooms and 9 bathrooms and a new Games room so is ideal for large family holidays, special celebrations, birthdays, and reunions. Our ocean hot tub/swim spa is available to for your stay including fluffy white robes and slippers! The house is truly luxurious with everything from underfloor heating throughout the ground floor & all bathrooms, to whirlpool baths, private balconies and romantic four poster beds. Beautiful period details combine with an abundance of modern technology including 3 dishwashers, ample fridges a cranberry range cooker with gas hob and most importantly the ice machine to keep the bar well stocked. Wifi, Ipod docks, the Wii and ample games for lazy days in or the large gardens are ideal for kids to play football or hide & seek while the adults take on a game of croquet on the terrace. We can also arrange in-house catering for you, to really help you relax and make the most of your time away. Games room with Pool Table & Table Football. Bull Bay Golf Club only 15 mins drive. Luxury Swim Spa/ Endless Pool available inc robes & slippers. Llanlliana Cove is just minutes away for a dip! It is rare that I review anything. Which is quite bizarre because I rely on other people's reviews when deciding to part with my hard earned nearly all the time. We came upon this wonderous place because we were looking for some accomodationon Anglessey that could accomodate a large family gathering. 10 adults and 4 kids and an array of young babies seemed like an ask. Nevertheless when we saw the house it appeared perfect. Set in virtually its own county the house sits remotely just outside the hamlet of Camaes but within a short drive of an array of beaches that would put the Spanish costsas to shame. Around the house there are walks to its own secluded cove and enough history to keep the raconteurs and associated history/geography nerds in our party in the throws of conversation for weeks. The children loved the animals that came and went, the boys were fascinated by the cows (although their mothers were less so). Then there was a well stocked play area with everything to keep the kids entertained - although in reality the outside world around them proved far more fascinating. For teh grownups there was a beautiful terrace and table that would have made al feresco dininga treat - although unfortunately the weather was never quite that good during our stay. Instead the 20 seater dining room was our evening home. The bar area and dishwashers aplenty made dining easy and comfortable. We all wished for a kitchen like that at home. The living areas were comfortable bordering on luxurious. Each of the 7 double bedrooms (five of which were en suite) were massive. We didnt want for space despite a litany of travel cots and childrens paraphanalia that we brought with us. Quite honestly it was a delight - and I'm not just saying that because Dan and Nikki seem like a lovely couple who went out of their way to make us welcome. if you have a large party and want a big house in the country to share for a weekend or a week this is it. We hope to return one day en masse (if they'll have us). Perfect House, Perfect Location, Perfect Hosts! My review title says it all. This is just PERFECT! It is an extremely quiet location with your own beach, hills to climb for spectacular views and animals grazing out in the fields. You could not ask for a more idyllic location if you are looking for a way to relax and unwind from all that life throws at you. We came over from America and had a combined vaction with our American and English Families so we filled every room to maximum capacity and there was still plenty of room for everyone to be comfortable. The dining room is an experience all on it's own. We had some additional family come to visit but didn't stay at the house and it was great that we could all sit around the table. The outside facilites are as great as the inside and the slate terraces make a great place to have a BBQ. We cannot say enough good things about this vacation spot and Dan and Nikki are two amazing people who are there to answer any questions or fulfill your needs without being in the way or intruding in your peace and quiet. Cemaes Bay is just a little way down the road and it has some fun places to visit and the pubs are great. Fish and Chips on the sea front brings back so many memories. Thank you Dan and Nikki for making this vacation so much more than we could have imagined at such a reasonable cost too! Thinking of staying in wales with a big group this is definately the place to do it! 3 dogs 5 children and 6 Adults arrived a little early but received a very warm welcome from Nikki - The house was ready and just as we imagined. The bedrooms were fantastic wonderful views from most windows - very clean lovely bedding and the ensuites showers were excellent with lovely towels supplied . Our order from Tesco's arrived and the kitchen had plenty of cupboard -fridge- and freezer space to put it all away. The weather was not too bad although have had better but childen and a couple of adults managed to swim at 'private cove' and have picnic as a table had been put at the cove We had a lovely weeks holiday walking the coastal paths playing with children bbq at the house eating and drinking on the terrace of the house. The family's live North and South all agreed was wonderful place for all to meet and holiday together. We booked Llanlliana for a bunch of friends for a weekend away in April 2012. We do this once a year for some chilling out and we generally stay at a country house. We spend our time on some walking, eating well, drinking slightly too much and generally having a laugh. We take it in turns to arrange the weekend and it was our turn to find somewhere for 2012. I think Llanlliana has raised the bar and made it impossible to do the same type of trip next year without us all instinctively comparing wherever we could go to Llanlliana- and I find it difficult to believe we could find anywhere better. The house is amazing and the standard of everything is absolutely 5 star. Every bedroom was immaculate and this meant none of the 7 couples felt they had drawn the short straw. The kitchen is superbly equipped and the dining room makes a superb area for entertaining. We had a fantastic BBQ one night and the views are great. Dan arranged for us to get the caterers in for the Sunday night and the food and service was wonderful. The house is set in a beautiful location and fantastic walks on the cliff tops are available straight out of the door. The walk to Cemaes Bay is great and the cove at the bottom of the field is stunning. Most importantly, Dan and Nikki are the ultimate hosts, allowing us our privacy but always there to help if needed and a great source of advice on everything you need to know to enjoy the beauty of Anglesey. Cemaes Bay is an idyllic traditional seaside fishing village with a beautiful sheltered sandy beach perfect for children to dig sandcastles and paddle. There are all the essentials- post office, chemist, butcher, baker, hotels, pubs & the fish and chip shop. The Heritage Centre has a local history exhibition and cafe or you could take a boat trip around the dramatic coastline for some fishing off St Patricks Island or to look at the seal colony on the Skerries. Walkers are spoilt for choice with direct access from Llanlliana onto the 126 mile long Anglesey Coastal Path, the section from Bull Bay to Cemaes Bay has been described by visitors as the most dramatic walk on Anglesey. If you are looking for an active holiday, the Isle of Anglesey has a lot to offer. It is an ideal place for watersports throughout the year. Coastering the sea cliffs, kayaking around St Patricks Island, wake boarding and kite surfing at Rhosneigr or an exhilarating rib ride up the Menai Strait. Golf: Golfers are well catered for with numerous courses including four 18 hole courses. Llanlliana is just a 15 min drive from the beautiful Bull Bay Golf Course, an 18 hole championship course with breathtaking views of the coast. Friday Changeover Day, Arrival from 4pm. £1000 refundable housekeeping deposit required. Up to 3 well behaved dogs permitted (allowed downstairs only) at a rate of £25 per dog per holiday. On booking a deposit of 30% required, balance due 90 days before start of holiday.